IRVINE, Calif. (BRAIN) — Bosch eBike Systems is launching a new sales support class at Interbike designed help retailers enhance their e-bike selling skills. MANHATTAN BEACH, Calif. (BRAIN) — Malakye, a career website and professional network for people and companies in the active lifestyle-driven industries, is bringing the Shmooz job event back to Interbike. The Shmooz will be on Thursday, Sept. 22, from 1 to 4 p.m. in Interbike's Recharge Zone. BOULDER, Colo. (BRAIN) — Donna Carpenter, the CEO of Burton Snowboards, will be the featured speaker at the Camber Outdoors' Thought-Leadership Keynote at Interbike. SAN JUAN CAPISTRANO, Calif. (BRAIN) — Interbike says its indoor e-bike test track, called The Circuit, presented by Shimano, is now filled to capacity with exhibiting brands. SAN JUAN CAPISTRANO, Calif. (BRAIN) — Interbike is organizing a volunteer service project to help build new singletrack trails just before its inaugural Fall CycloFest festival, which will be held in October at the U.S. National Whitewater Center, in Charlotte, North Carolina. Cannondale, Accell, QBP, and the U.S. Secretary of Transportation are among the nominees. SAN JUAN CAPISTRANO, Calif. (BRAIN) — Interbike has announced the final round of nominees for the 2016 Interbike Awards, including nominees in the athlete, advocacy and supplier categories. The award winners will be announced at the IB Awards Gala at Interbike next month. Park Tool signs on as presenting sponsor. SAN JUAN CAPISTRANO, Calif. (BRAIN) — Interbike is adding a new show feature, the Interbike Mechanics Challenge, presented by Park Tool. SAN JUAN CAPISTRANO, Calif. (BRAIN) — Following last year's "Breaking Away" reunion at the Interbike Awards Gala, this year's Interbike awards ceremony will include an appearance by at least four of the top-billed cast members of the 1985 cycling film "American Flyers." SAN JUAN CAPISTRANO, Calif. (BRAIN) — Interbike has launched of a series of educational seminars designed specifically for suppliers and their staffs. SAN JUAN CAPISTRANO, Calif. (BRAIN) — Mann University will offer two 1/2-day retailer education sessions at this year's Interbike expo. The sessions will be on Tuesday, September 20 and Friday, September 23. 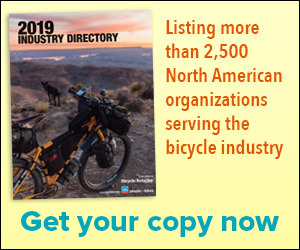 LAGUNA HILLS, Calif. (BRAIN) — Bicycle Retailer has set news and product submission deadlines for its annual Interbike Show Issue as well as the Interbike Show Dailies distributed at the Vegas expo.